Sometimes the eggs under turkey hens do not hatch and may need some assistance. 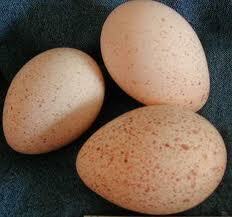 You should consider incubating turkey eggs to ensure a good yield of fluffy white birds. The requirements for hatching and incubating turkey eggs differ from that of chicken and other poultry. Before you set out to inc tubateurkey eggs, you will require essential equipment like the Setter and Hatcher, which should be from a leading incubation equipment manufacturer. Apart from this you will need a temporal thermometer which allows you to scan the forehead of the bird to measure the temperature. There is also a good gas filled thermometer which is exceptionally accurate. Start with setting up your incubator at least 24 hours prior to placing the turkey eggs inside it. Now fill up the lower channel with water to keep the incubator unit humid at all times. Put two thermometers inside the incubator. These should be placed at half the height of the eggs which is approximately 1 inch. Cut out disposable plastic cups to the required height and use these as a base for the two thermometers. To create a wet bulb thermometer for measuring the humidity in the incubator, attach a piece of fabric to the bulb of one of the thermometers. The other end of this thermometer should be in the water channel below. If the bulb is wet you will be able to approximate the level of humidity at one easy glance. Ensure that the wet bulb temperature reads between 29 to 37.5 degrees C while the other thermometer should always have a stable temperature at 37 degrees C.
Use a regular pencil and lay the eggs flat on their sides. Now mark each side with an id so that when you turn them, you are able to do so at a 180 degrees rotation. Do not use any other material to mark the egg shell as the chemicals damage the turkey when they seep inside. Carefully slide the eggs into the incubator with a similar marking facing upwards. Now let them incubate for an approximate time frame of 28 days. This is what the natural incubation period is for turkey hatchlings. Turn the eggs 3 – 5 times daily so the developing turkeys do not stick to the egg shell during incubation. Apart from this, you should not touch the turkey eggs to allow a smooth hatching. Make sure you check the water level in the channel underneath because if it is too low then the incubator will become dry which will result in cracking eggs. The ideal humidity should be 65%. When the turkey cracks the egg shell, you must not move the eggs at all for a hatchling might not be able to break through. Stop moving them in the last three days of incubation which is when the turkeys start getting into the position required for hatching. It is an interesting fact that you can hear them chirping approximately six to ten hours prior to hatching. Normally a crack appears at the thicker edge of the egg and then the turkey starts working its way around the circumference of the egg shell. This is why they normally open up like a cap! This process takes approximately 5 to 10 hours and results in the appearance of a chirping, unsteady turkey which is soaking wet and tired. This is the time that you should keep it warm and let it rest to regain its strength. Apart from this you can show the turkey where its food and water lies 24 hours after hatching. Simply get its beak gently in the water and let it drink the liquid. Try this strategy with the food also and soon enough the turkey will start feeding and drinking independently.